Most of you who visit my blog also visit my family's blog as well, so you most likely know that Eli is here and now doing well (isn't he a cutie?). What you may not know is all that went on and how God was gracious to pull us through it. I've decided to post what I've learned or had confirmed through this experience. Mark blogged about all that went on with Eli. I would like to do that as well, only from my experience as a mom. After months of waiting, and what seemed like hours of waiting at the hospital, Eli was here. I can't tell you what it's like to hear your baby cry for the first time. If you're a mom, you know what I mean. He got a 9 and a 10 on his apgar scores - pretty close to perfect. I got to see him for about 20 seconds, give him a kiss, and then they took him to the nursery to be cleaned up while they finished stitching me up and taking me to recovery. All I wanted was to hold him and be able to look him over, making sure he had all his fingers and toes, to admire him, and shower him with more kisses than I'm sure he would've liked. Little did I know all that was going on since I was in the OR another 20 minutes and then in recovery for an additional 15-20 minutes. Eli started grunting - a sign of respiratory distress. He lost his nice pink color and turned white. Due to this, when I came out of recovery I was informed that he had to stay in there for more tests, that he was having trouble breathing. The pediatrician then came and told us that Eli's heart was in the center of his chest and that both of his lungs were partially collapsed - a condition known as pneumothorax. They contacted AR Children's Hospital to see what they recommended. We were supposed to be able to see him for awhile, but were soon told that we weren't going to be able to see him at all that day - they were getting him ready to be put under an oxygen tent, on an IV, and a feeding tube. Needless to say, I was devastated. Not only did I not understand all that was going on, why it was happening, or whether he was okay, I couldn't even see him because I had to stay in bed for 24 hrs. I relied on Mark, our family, and the staff to tell me about him. Simply put, it was hard. Fortunately, there was a nurse who must also be a mom, because she snuck Eli out of the nursery before hooking him up to all of the equipment and let me hold him for 15 minutes. I can't tell you what it meant to me and I'm not sure I could have ever relayed that to her, but it meant everything. Day two was also difficult. I could then get up and move around. God was merciful to me in that by the time they let me get up, they already had Eli unhooked from everything except his IV's. God must've known that I wouldn't have been able to stand seeing him like that. We were only able to have Eli 1 hour every 12 hours. The x-rays this day showed that his condition was the same, which they said was good since it wasn't getting any worse. Day three we got to have him every time he woke up and wanted to eat. It was great. I loved being able to hold him and just stare in admiration at him. The x-rays showed that the air pockets were going down, his lungs were expanding, and that his heart was moving back to the left. Relief doesn't explain how I felt. Day four, we got to come home! Staring at hospital walls gets old quick! :) Mark and I were elated and it's so true that there's no place like home. So what did I learn? To begin with, God once again confirmed to me just how great of a husband I have. Mark stood by me the whole time, kept me up-to-date, ran to the nursery every few minutes so I could know how Eli was doing, snuck extra juice from the 'nourishment room', made late night trips to Cracker Barrell, but most of all, just understood me and helped keep me calm during a difficult time for both of us. He was so wonderful to me and knew just what I needed when I needed it. I learned that the past doesn't have to bring resentment. 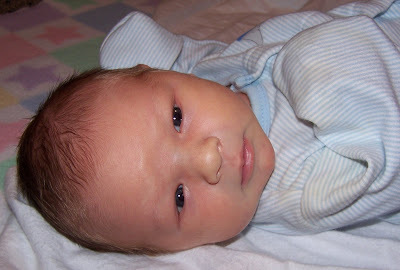 As most of you know, I went through labor with Anna and then ended up having a C-section. The particular doctor that did the surgery with her used staples, something I thought was normal until I had Eli and had sutures. The recovery was 10x's easier this time around, something I am quite thankful for. Another doctor told me that only 2 doctor's still use that method, her being one of them. I've had several people tell me how mad they'd be and would never use her again, etc.. While I certainly never plan on using her again if I can keep from it, I have Anna and that's all that matters. It's over, I recovered, and being angry about it doesn't and won't do me any good. There are more important things, like seeing Anna's smiling face every day. I also had confirmed just how great of a family we have. They helped us more than we'll ever be able to thank them for. Whether it was staying with Anna, bringing us food, being at the hospital supporting us, or staying or coming once we got home to help out, it meant a lot. They were truly wonderful. I also learned that it's okay to ask for help. In an ideal world, we were planning on coming home from the hospital and trying everything by ourselves. It obviously didn't work out that way and asking for help was essential. Most importantly, it was okay. Asking for help didn't make me any less capable or a bad mom. It just meant that I hadn't, and still haven't, learned how to handle everything at once. And that too is okay. But most of all, the main thing I learned is that God prepares us for the things that we go through. While I was pregnant, knowing that Eli had SUA was a cause for a lot of worrying on my part. It turned out to be nothing more than a weird fluke that I had wasted time worrying about. Yet in an odd way, it helped prepare me for all the Eli went through. Worrying about it was nothing compared to dealing with his heart and lungs. I quickly realized how trivial it was in comparison to what he was going through. Yet through it all, I had peace. I knew that God was in control and that He had the ability to make everything okay, which He graciously did. How funny is it that the Air 1 Verse of the Day was Isaiah 43:2: "When you go through deep waters, I will be with you. " I remember Mark checking my e-mail that morning and reading it to me and me saying "Why are you telling me that? ", thinking all along about something going wrong. Then I knew why. How great that God told me that very morning that He'd be with me. I find it not at all coincidence, but rather God graciously preparing me for what happened. And how funny that the song we chose for Eli couldn't have been more perfect. I've learned that God truly does keep us safe 'til the storms pass us by. Well Phebbs, I have to say that little Eli is a gorgeous one and I am also glad everything ended up great...Sorry I havent made it to the house yet to visit. I will get over there though and if you guys need anything before then or need to watch miss Anna (I know Eli is still too young is why I didn't include him) just holler.